Lauren Faust created My Little Pony: Friendship is Magic, a show that redefined television for girls by refusing to be (in her words) "a puddle of smooshy, cutesy-wootsy, goody-two-shoeness." 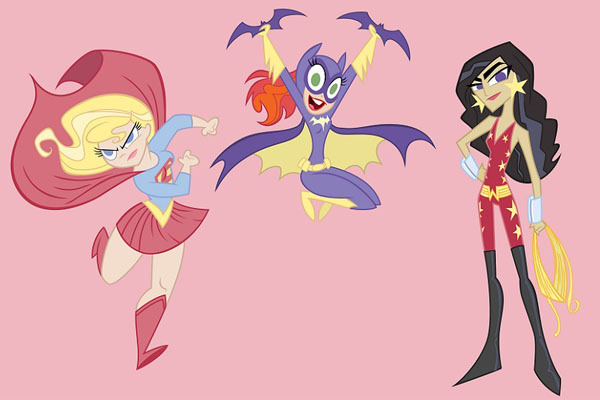 When Cartoon Network created DC Nation to showcase short films about the DC Universe, Faust got to tackle one of the other typically challenging areas of female entertainment, superheroines. Just recently, the CW gave up on developing Wonder Woman into a TV show, calling it too challenging. Well, maybe they should hire Faust, because she seems to have a handle on superheroines. She created Super Best Friends Forever, a series of five short films about the superheroines Supergirl, Batgirl, and Wonder Girl, Wonder Woman's sidekick. They are awesome. I found a video that has all five shorts in succession, so if it seems a little choppy, just know a) the shorts tended to hint at a larger world and started and ended with threads dangling, and b) there's no marker to indicate when one ends and the next begins. But you'll get the idea. One design choice I must point out is that the three of them have different body types. Batgirl has what I'd consider the average female body type in comics, but Wonder Girl is tall and slender, and Supergirl is more voluptuous (morbidly obese by comic book standards). I can only imagine how inspiring it would be for girls to see their heroines with bodies more like their own. Sadly, SBFF will not be returning next year, but here's hoping we get to see a full half hour of these ladies one day. Would you have watched Super Best Friends Forever? I don't think I'd be watching that but I think overall studios are too cautious when it comes to superheroines. And yet it seems they'll make a movie for just about any male hero, even those who aren't human like that raccoon and tree in Guardians of the Galaxy. I watch the super hero cartoons W/my son & daughter. My daughter likes the shows when there are girls she can relate to. We also watch My Little Pony: Friendship is Magic I guess that makes me a Brony. Is this what I miss by not having kids? The writers of Xena got it right as well.